All Glory, Laud and Honor hymn was written by St Theodulf of Orleans while imprisoned in the cloisters of Angers, France in 820. It was originally written in Latin under the title, 'Gloria, laus et honor'. The English version is a translation by John Mason Neale. 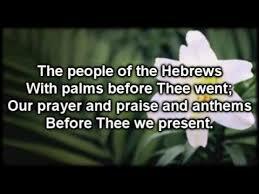 It is based on Matthew 21:1-11 although reference to 'palm' follows the Biblical version of John's Gospel since both in the gospels of Matthew and Mark the crowd use branches from the trees.